Hi! I'm so excited to be a guest designer for CASology this week! I've just really enjoyed making CAS cards lately - because the rest of my house is not so CAS maybe! When I saw that this week's Cue Card was Three - I knew I wanted to do 3 butterflies... which is not that creative of me since I use these butterfly dies all the time. I knew I wanted a touch of greenery in the background and I love Memory Box's Fresh Foliage but it was just a bit too much. So I just trimmed some stems and leaves off for a cleaner look. I was inspired by the tone on tone flowers in this week's Cutting Edge Card and the paper piercing. Instead of using a paper piercer though, I used my sewing machine to "sew" the edge of my panel but without the thread... much faster and more even than I could have done! I hope you can play along! And thank you, Melissa, for having me as your guest designer! P.S. I just thought I'd share quickly an organizing idea I had that has worked for me. I don't know about you but I die cut something, change my mind on the color or paper (usually several times), and end up with a pile of die cuts that don't get used for that particular card. But then I remembered I had these baseball card holders (bought for another purpose) and thought it would be perfect to organize my scraps. This way I can quickly see what I had already cut - most of the butterflies I used in today's cards were from my "scrap" die cuts! I used 1/8" Scor Tape to adhere my flimsy baseball card holders to a thick page divider to hold it up in my binder. On the back side, I taped a larger pocket to hold bigger die cuts or backgrounds. 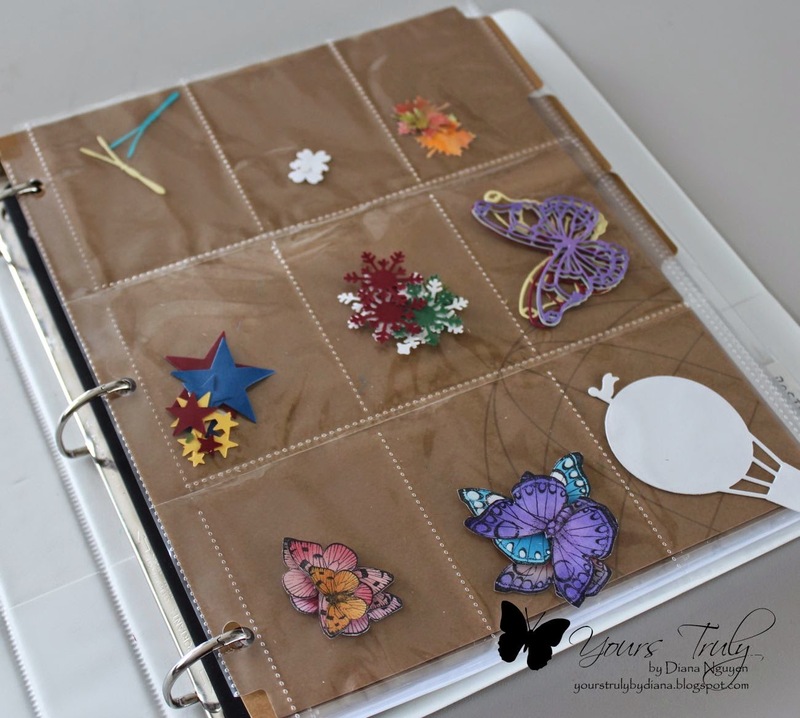 It's great for keeping all those extra letters or even parts of a card you are working on! Hope this helps you and thanks for reading all this long post. Have a great day! So pretty! Love the bright colours and the pearls! Great to have you as GD this week, Diana! The shadows from the Butterflies are great. Scraps in the baseball card holders make an easy way to see and store. Praying you have an awesome day filled with joy. Thank you for joining our 148th challenge. Beautiful, simple, great dimension, thanks! Diana, your organization idea is clever! 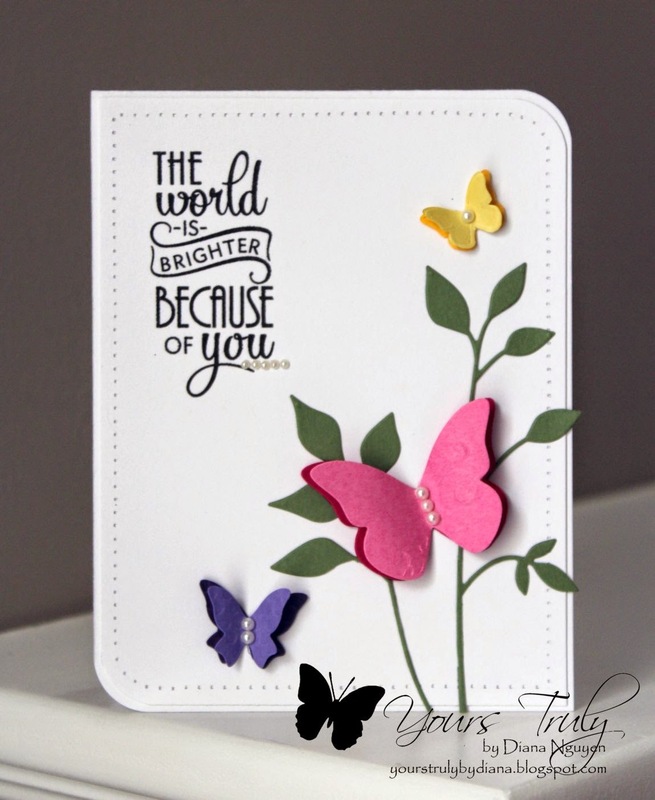 I'm a fan of butterflies as well so this card makes me happy! 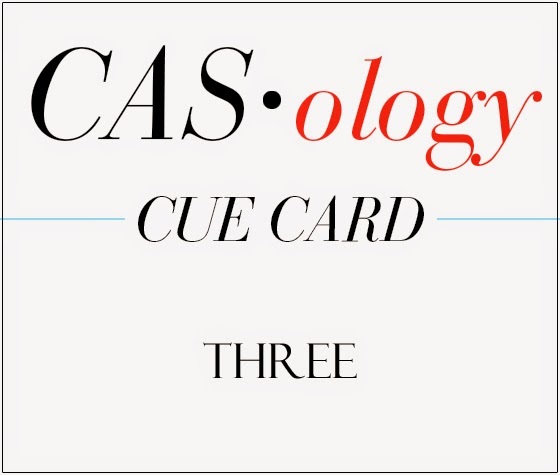 Thanks for being a part of the CASology team this week! Love your pretty, CAS card! 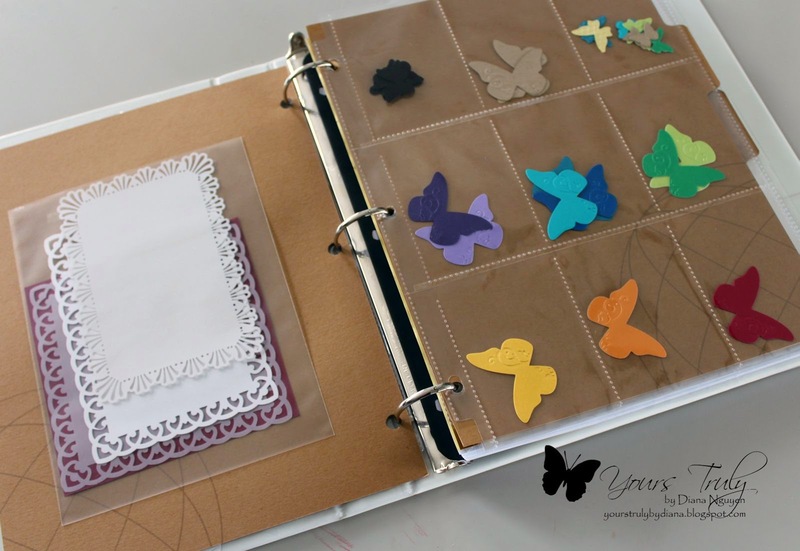 You can never have too many butterflies in my opinion :) Love your organising idea too - I do often have stray die cuts cluttering up my desk! Diana, your card is beautiful! 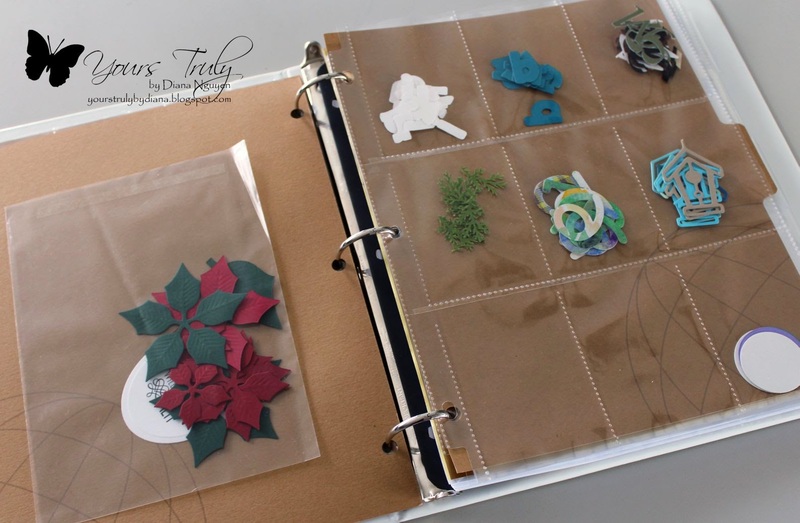 I like the tips you shared especially the one to pierce your cardstock with your sewing machine.....I know I knew that but I had forgotten! Thanks so much for that reminder for something easy to add to my cards! Thanks so much for playing along with the Cutting Edge Challenge! Love this card. So so pretty! This card is beautiful--I love butterflies, too. Your organizing tip for extra die cuts is so smart. It's lovely having you here with us as a Guest Designer at CASology this week. What a beautiful card, Diana!! Your butterflies are perfect with your sentiment!! Thanks for your organizing tip...I had jars of unused die cuts and unfortunately being so chaotic, I recently tossed them all...wish I had waited:(! Thanks so much for joining the challenge this week at The Cutting Edge:)!! Diana - your card is beautiful as always! I especially love your organizational idea since I'm retiring in just a few days and re-organizing my craft room is just one of the many projects coming up! TFS! Aww, this is truly wonderful...I love how you make CAS, perfectly elegant cards. We appreciate you joining us last week and would love for you to play along with us again this week at Word Art Wednesday. Leaving you with God's Word in Hebrews 12:2---"Let us fix our eyes on Jesus, the author and perfecter of our faith, who for the joy set before him endured the cross, scorning its shame, and sat down at the right hand of the throne of God." Hugs and blessings!